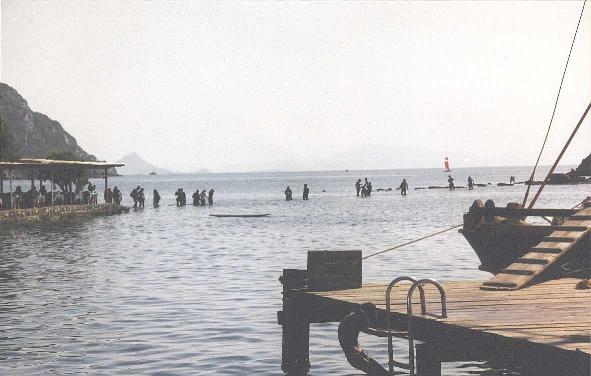 A deceptive move by the people who are walking through the sea to reach Rabbit Island to feed the rabbits in Gümüşlük. Relaxed atmosphere and fish restaurants are very famous in Gümüşlük.. Gümüşlük is 15 km from the great tourist town of Bodrum. People from all over Bodrum peninsula visit Gümüşlük for having a fish lunch or dinner. You can also see the walls of sunken city of Myndos near Gümüşlük..
Come and visit Bodrum for relaxation after Olympics. Both fish and tranquil scene are good for your tired nerves.. Fake is a movement made with the aim of deceiving an opponent. In other sports (like basketball, soccer etc.) players use their eyes, head or any part of the body to trick an opponent. In bridge sport you have to use your nerves to trick an opponent. In this lesson I will tell you about some fakes in bridge. If you learn and apply fakes, you will see how helpful they are for surviving! An average player in East will not continue with A. Because, East will think that: Q was your singleton, and you will ruff East's A. After you ruff A, dummy's J will be a master. So, you can discard your loser on dummy's J. With these toughts, East will probably switch to clubs instead of playing A. As soon as he plays a club, win it in your hand, draw trumps and discard your 3 to one of dummy's heart and make your slam! If you played 3 instead of Q at the first round, there is no doubt that East would continue with A and you would go one down.. Playing Q in the first round was your fake. Running away is useless; a bear can always catch you. If you lay down as a dead body, you may save your life..
You can perform below fake if you are afraid that opponents will switch to another suit. West leads 5, dummy plays 8 and East 9. This is the moment that you must show your fake: Win the trick with A instead of winning with Q (fake!). Then cross to dummy with K and lead Q for finessing K. West will win this trick. Now, if West switches to spades you can not make your contract: Opponents make 4 spades and 1 heart. But, West who is influenced by the atractional force of your fake, will play low diamond. Because he thinks that his partner will win the trick with Q (This is normal effect of your fake) and will return another diamond to defeat the contract.. With these thoughts West plays low diamond, East plays 6 and you win with Q! Then you can easily make 10 tricks as, 2 diamonds, 4 clubs and 4 hearts.. If you won the first trick with Q, there is no doubt that West would switch to spades when he obtained lead with his K. Playing A in the first round was your fake. Declarer (South) led a small spade to the 8. Without the slightest hesitation, Geir took the King! Declarer won the continuation. Then followed the A and a spade to 10, and somewhat suprised declarer saw the Jack appear on his right. If Geir Helgemo had taken the first spade trick with the Jack, declarer would probably finess Geir for the king..